08 Aug 2018 - Add sensitivity analysis to README All of the relevant input data and plotting scripts were added in previous commits. This commit adds this analysis to the top-level list of what analyses we performed as part of this project. 08 Aug 2018 - Add background context to README I thought it would be better to have a bit more background information about why we did the study, and what questions we were trying to answer, to contextualize the analyses that we performed. This commit adds more of this context, and improves the readability of some of the brief analysis descriptions. 08 Aug 2018 - Improve descriptions in README I realized that it was previously a bit hard to understand the directory structure, namely that things are divided up by which virus we were looking at, and then which analyses were performed. This structure was chosen because the types of analyses performed varied between the 3 viruses. I edited the README to make it easier to understand this structure, and better point to where relevant data and results would be. 08 Aug 2018 - Update README to describe sensitivity analysis I realized that this sensitivity analysis was never actually pushed up to GitHub. This commit rectifies that, and updates the README with a brief explanation of the sensitivity analysis and the resulting figure. 08 Aug 2018 - Add xmls and log files from clock sensitivity analysis This commit pushes up the XML files that BEAST would read in as well as the BEAST output log files for the BEAST runs performed as part of the sensitivity analysis we performed to investigate clock rate prior choice. Note that reading in the logfiles to Tracer (program in the BEAST suite) will allow you to generate the skyline plots, and export the TSV files, which is how the TSV files that are also in this repo were generated. 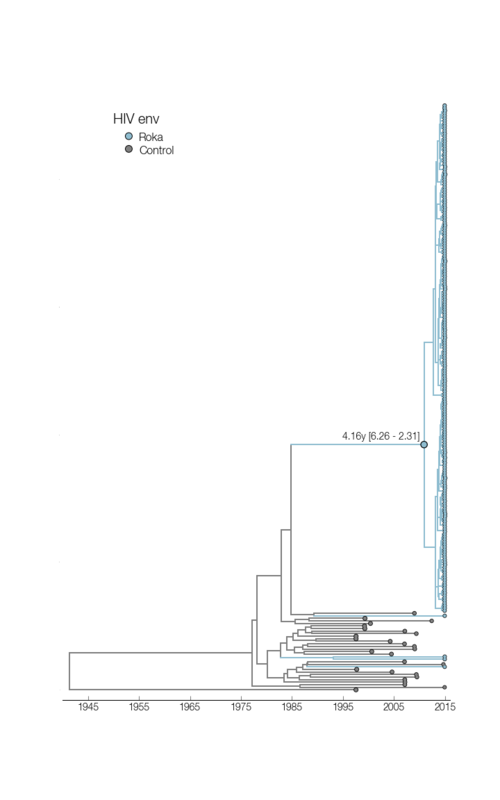 This directory contains files for inferring temporally-resolved phylogenetic trees HIV-Env. PDF versions of the figures shown below are also saved here. The .trees file contains 2000 trees representing independent draws for the posterior distribution of trees.